To prepare the eggs, put them in a large pot of water and bring it to a boil over high heat. As soon as the water boils, take the pot off the heat, and let it rest for nine minutes. In the meantime, prepare an ice bath for the eggs by filling a large mixing bowl or pot with ice and cold water. Transfer the boiled eggs from the stove to the ice bath. Allow the eggs to cool completely. Remove them from the ice bath and peel them. Halve the peeled eggs horizontally. Scoop out the yolks and place in a food processor, setting the whites aside on a platter. On each half, carefully slice a bit from the rounded side, making a flat surface so the egg can sit upright on the plate. Add the shallot, mayonnaise, mustard, fried garlic, and a sprinkle of salt to the food processor. Pulse until smooth and creamy. Spoon the egg mixture into a gallon-sized Ziploc bag and snip a bottom corner. Carefully pipe the paste into the egg white halves. 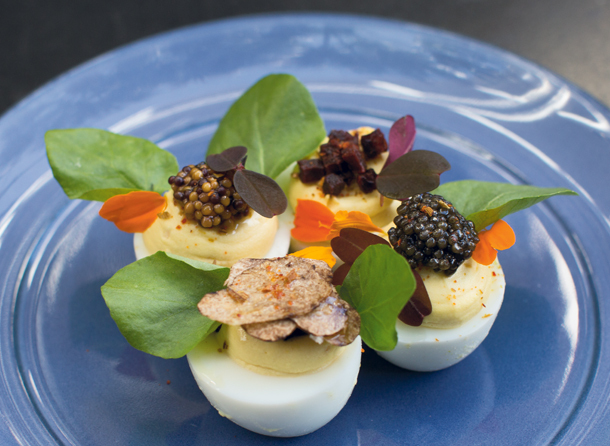 Garnish with your choice of toppings, such as caviar, pickled mustard seeds, truffle shavings, and/or crispy ham. Pulse two cups of peeled garlic in the food processor until minced. Lightly salt the garlic and let it sit for five minutes. Place the garlic in a kitchen towel and then squeeze out all of the liquid. Heat two cups of canola oil in a large pot over high heat, then gradually stir in the garlic and reduce the heat to medium high. Stir the garlic for about 15 minutes, until it turns golden brown. Drain the garlic in a fine mesh sieve, pressing it with the whisk until all the oil drains out. Spread the garlic on paper towels and cool to room temperature. Stored in an airtight container with silica gel, the garlic will keep for up to two weeks. To get tips from the chef on making the dish, click here. For more recipes to bring to the table, click here.